Here in western and northern Europe, we are still basking in glorious sunshine with very hot temperatures and no let up as the heatwave which began in June is still at large, in my town of Alkmaar in North Holland we haven't seen rain for 60 days. 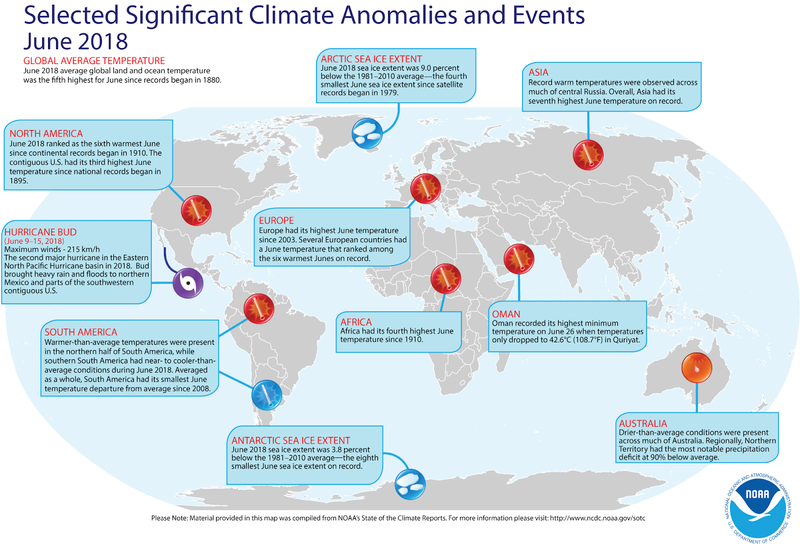 The persistent drumbeat of warm temperatures around the world last month made for the fifth warmest June on record and the first half of the year the fourth warmest for the planet. The average global temperature in June was 1.35 degrees F above the 20th-century average of 59.9 degrees. This was the fifth highest for June in the 139-year record (1880–2018). Last month was also the 42nd consecutive June and the 402nd consecutive month with temperatures above average. The year-to-date average global temperature was 1.39 degrees F above the average of 56.3 degrees. This is 0.52 degree lower than the record high set in 2016 for the same YTD period. Low polar sea-ice coverage: The average Arctic sea ice coverage (extent) in June was 9.0 per cent below the 1981–2010 average, the fourth-smallest extent for June on record. However, there was above-average sea ice in the eastern Hudson Bay. The Antarctic sea ice extent last month was 3.8 per cent below average, the eighth smallest on record for June. However, Antarctic sea ice coverage expanded at a rate faster than average in June, ending the month at near average. Warmer-than-average lands and oceans, again: The globally averaged land-surface temperature was sixth highest on record for June and the fifth highest for the YTD (January–June) period. The globally averaged sea-surface temperature was sixth highest on record for June and the fifth highest for the YTD. Record heat felt across the continents: Record-warm YTD average temperatures dominated across parts of the world’s oceans, New Zealand and some areas of North America, Asia and Australia. Europe had its second-warmest June on record, with several countries logging average temperatures among the sixth warmest on record for the month. Africa, Europe and Oceania had a YTD average temperature ranking among the five highest since continental records began in 1910. More > Access all of NOAA’s monthly climate reports and download related maps and images.